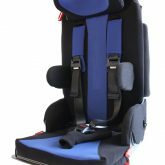 Lets-Go is a fully adjustable car seat designed from the outset for children with special needs, and offers excellent posture support options, comfort and growth for your child. Support – Lets-Go features many positioning and postural support options, including, footrest, lateral supports, headrest, abduction pommel, leg supports, playtray, etc. 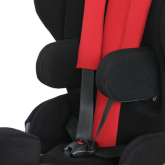 Safety – Lets-Go features include a 5-point comfort padded harness for postural support, Iso-fix connection for stability and the use of the vehicles seat belt system. Lets-Go has been crash tested and conforms to EC44-04, ECE R16, ECE R14. 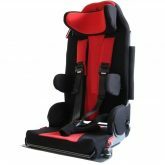 There are 3 sizes available with weight capacities of 22kg, 36kg, 75kg. Swivel – action turn-out options makes entry and exit easy and you can specify for either left or right side to suit your personal needs. 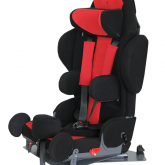 Compact – Lets-Go is designed to be compact, with slimline cushion and backrest panels, to maximise the space and headroom in your car. 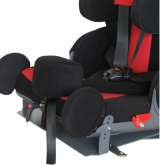 The slimline cushion also allows more entry room through the vehicles door for growing kids.